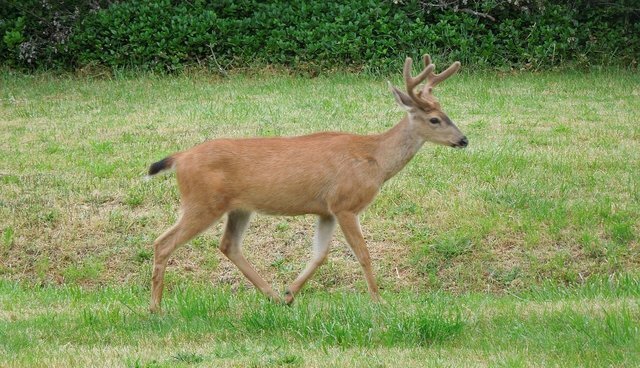 Spending taxpayers' money with a degree of secrecy that Eisenhower and Churchill might have envied in planning D-Day, Oak Bay Mayor Nils Jensen has claimed "success" in another war against a timid adversary - known as the black-tailed deer. This small race of the mule deer is in decline on Vancouver Island, but still deemed "too common" for an undisclosed number of Oak Bay residents. Oak Bay is part of the greater community of Victoria, capital of British Columbia, located near the southern tip of Vancouver Island, which is nearly 300 miles long and about 50 miles across at its widest point. In February and March, Oak Bay conducted a highly "covert" operation in which it trapped deer in "Clover traps": collapsible frameworks covered with net mesh. A deer entering the trap triggers the door to drop as he or she starts to eat the bait. The traps are set in the evening and checked by the cull contractor early in the morning to avoid public scrutiny. Once the cull contractors arrive, one of them collapses the trap and sits on the panicked, struggling deer while the other grabs the animal's head, presses a captive bolt pistol to the skull, and discharges a metal bolt into the animal's brain. Researchers believe that this method causes suffering, as was explained to the mayor. It appears that most Oak Bay residents are not bothered much, if at all, by the deer - and many enjoy them. All agree that more might be done to reduce the already-small incidence of cars hitting deer, but most of those occur in one area where mitigating factors could be implemented (as was done in Ottawa with significant success). But, no; the mayor's response to such concerns ranged from killing to ... killing. Other concerns? One was that elderly people were afraid to walk the streets at night for fear of, well, deer attack. (No, they really weren't - and they said so.) Another concern was about deer eating garden plants. Looking at the lush greenery of Oak Bay, boasting the most luxurious gardens in Canada, and thinking of the expanse of snow covering my own garden back home in Ontario, the concern seems laughable. Deer in Victoria, like snow in Toronto, are part of the environment (except that, in Victoria, you can grow so much more, and even year-round). We saw no browse lines and no depleted cedar or other signs of a large population of deer. And, why 25? No one knows how many deer are in that region, let alone how many deaths it would take to satisfy the unknown number of complainers (very few, judging from what documentation we were able to access). But, 25 was apparently the number the council felt it could afford to kill. No one explained why that number would stop those complaints that so bothered the mayor. In fact, as we also explained, culling deer tends not to reduce population numbers. In Helena, Montana, they've been culling them for a decade without resolving whatever the concerns may be. In Cranbrook, in central British Columbia, there was a dramatic increase in "aggressive" deer following culling (although it has to be said that Cranbrook's council did not define what was meant by "aggressive" and has done nothing to teach folks about co-existing peacefully with the deer). It's impossible, using Clover traps and bolt guns, to remove what few deer, if any, might be the ones who have frightened people. Since fawns stay with, and learn from, their mothers for close to a full year, it's also impossible to know how many of the seven does who were killed in Oak Bay left orphaned young. The Oak Bay residents I talked to, including many store clerks and service staff, were not only against the cull, but of the opinion that the $220,000 spent by the Capital Regional District and the more than $30,000 spent by Oak Bay could better serve the broader communities. But, that is of no obvious concern to the mayor. He is apparently happy that 11 deer died miserably, and Oak Bay citizens discovered that their government is not as democratically transparent as they might have thought. But, it's not over. Mayor Jensen wants to keep on killing and keep up the secrecy. Increasingly, though, the good folks of Oak Bay are learning what kind of mayor he is. And, as any Torontonian can tell you, bad mayors and their policies don't last.